My paintings are reflections of changing ideas about the societal relationships to the land, the American experience, and the American dream. The landscape is an arena in which many different dramas of the American dream are played out. Trailers, houses, and strip-malls evoke shared experiences. This common denominator gives my work a broad resonance that allows even fragmentary visions to evoke complex narratives. My watercolors and oils eschew the particulars— what makes a location unique—and focus on the iconic—what makes disparate subjects universal. Photography is essential to my creative process. I create images that mimic photography—and photography’s implied veracity—that is not a photograph. My photorealistic paintings are created by piecing together images to create buildings and landscapes that do not necessarily exist in objective reality. 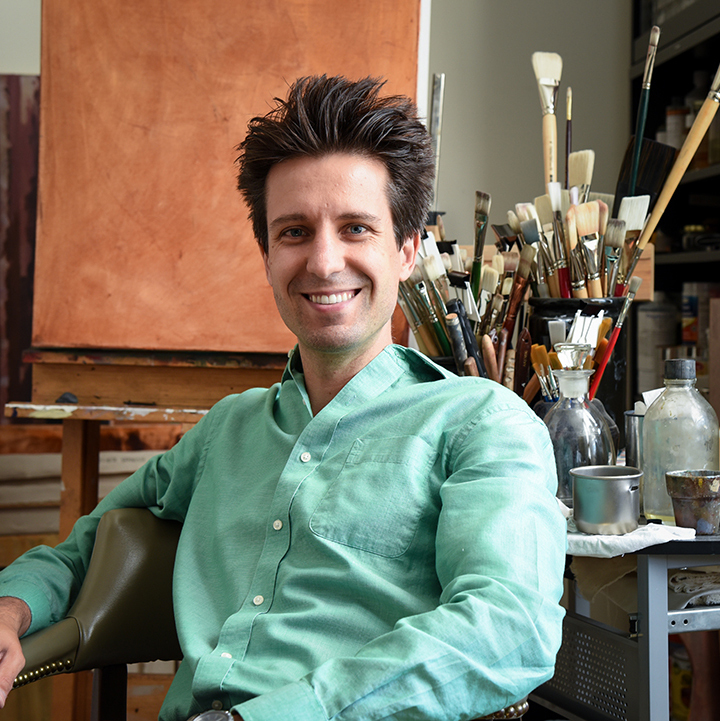 Scott Nelson Foster received his first instruction in drawing and painting from his uncle, Roland Giampaoli, and from his grandfather, Will Nelson, while growing up in Boise, Idaho. From them he learned a variety of expressive and analytical watercolor techniques. Mr. Foster has worked in a variety of two-dimensional media, including wax, glue and egg temperas, watercolor, oil, and serigraphy. His paintings have been featured in solo and juried exhibitions on the east and west coasts. He has recently completed portraits commissioned by the St. Kateri Tekakwitha Parish and the Musician of Ma’alwyck. His interest in esoteric and unusual artistic practices has allowed him opportunities to work with iconographers, fresco painters, performance artists, and alchemists. Mr. Foster received a B.A. in Fine Art from Northwest Nazarene University, and an M.F.A. in Painting and Drawing from Utah State University. After teaching in Utah for a period, Scott relocated to upstate New York, where he paints and teaches at Siena College. Introductions by Thomas Jay Oord, Chris Baker, Gloria Coffin, Craig Drury, Graden Kirksey, Lisa Michaels, and Donna Fiser Ward, eds. (San Diego, CA: Sacrasage Press, 2017): 171-174.